Accelerated Mobile Pages Magento extension helps website content load significantly faster on all mobile and tablet devices. Magento AMP plugin can improve your search engine visibility, increase site traffic as well as your conversion rates. Improve your store ranking in Mobile Google Search Results. Reduce the average load time of mobile store page to less than half a second. Create separate mobile pages for Homepage, Category Pages, Product Pages and CMS Pages, highly optimized to support latest Google AMP Technology. Magento AMP plugin is based on open source project from Google and Twitter (ampproject.org), designed to make all mobile pages really fast. Some of you may already know similar projects from Facebook and Apple - "Facebook Instant Articles" and "Apple News Format" and now this technology is available by Google and used on thousands of websites. Automatically generate Google AMP Pages for Homepage, Category Pages, Product Pages and CMS Pages. Easily edit AMP homepage content from Magento backend. The extension will automatically add rich snippets to Magento AMP pages. Integrated Google Tag Manager (GTM) and Google Analytics allows to track user interactions with AMP pages. Your AMP content will appear at the top of the Search Engine Results Page (SERP) as part of the "Top stories" section. Google may also display your Magento AMP pages anywhere across the entire search results page marked with special "lightning bolt" sign. Lower your bounce rates by improving the magento performance. Accelerated Mobile Pages are much faster compared to non-AMP ones since they load directly from Google AMP Cache. All AMP pages created by this Magento Extension will be super lightweight and make minimum http requests to speed up page load time. Magento Accelerated Mobile Pages Extension was designed to work flawlessly with any third party magento theme. This extension will create separate AMP Magento Theme that will work independently from your existing responsive or mobile theme. Whether you have a custom design or popular theme like Ultimo, Shopper, Fortis, etc. – AMP templates will work alongside any theme. I was impressed with the installation service and the rapid increase in Page speed, from 7 to over 50, and expecting further improvements over the next couple of weeks. Eventhough our version of Magento is outdated and heaviliy customized, the extension was installed easily and worked great! We are already enjoying an increae in traffic! This module really makes your Magento fast on mobile devices. We have installed that module for our old Magento 1.9 store. it's worked as quickly as your guarantee. Thanks a lot! It's good to know that the module supports Magento 2 AMP for CMS pages in the latest update. I have installed Magento 2 and my website working fine fast on mobile . Thanks a lot! Great support team! After implementing the amp extension the page load time is 1.8 seconds only. This helped my sitewww.guardian.in to get good ranking also in google crawlers. Very good follow-up, improvement and update of the AMP extension. The configuration of the plugin is simple and fast. Highly recommended! Our AMP pages load really fast on mobile now. Amp is a very good plugin. Easy to work with and its a very good improvement for the loading time of my mobile website. It's so much faster now. I would like to recommend this extension for those Magento Stores who want to speed up the website. I personally noticed that AMP version of the website does a great job and I observe through Google analytics. As many of you aware that Google SEO have more than 200+ algorithms to enhance search results. There is an important algorithm called link magnet. Link magnet is directly proportional to user spending time on your website. In Google analytics, you can see that as "User Sessions". After installing amp extension I had to do some tweaks with the help of plumrocket support team. I love their support and prompt reply. I am getting all replies within 24 hrs. I noticed that the session time increase on average of 2 minutes to 4 minutes. It's all because of mobile users spending much time on amp version of the Magento store which is very fast and quick loading which helps user to spend more time on the website. User session time spent also sends strong signal to Google and this website have good interaction because user spending a lot of time on this website. This is indirectly helps to boost the SEO traffic according to my analysis and knowledge. Overall my experience with plumrocket store is good. They need to increase the life time of the support period. One more reason I bought this extension because they have extension for M2 as well. If I upgrade M2 then I can get the M2 extension from this plumrocket team itself with good discount. After some tweaks AMP site is rendered accordingly to google specs. I'd like to highlight great support team, they're the best. Most of my req regarding modifications of AMP code were adjusted the very next day. It is a wonderful module with wonderful support. I had few problems with some conflict but support did a great job. Thank you Plumrocket. Keep the good job you are doing. as usual, just extracted and uploaded to web server. and viola, this extension was installed in split second. configuration was easy, just followed the manual. and my website was turned into AMP within 5-10 minutes! I am very happy with my purchase. the extension is great and of good quality. And, the most important, the support is excellent. they are very fast and efficient ! Very nice extension, it does what it says. Very easy to install and to setup. this extension is best for magento amp. Also the fantastic work of Plumrocket! Keep up this very good work! Amp is a very good plugin. In standard installation everything worked fine. This is very good,and the service is also good. They have a very fast service and support! You buy the extension, they update it, 3 months later you can not get free updates. There are shoes that come with more guarantee then this. If you want this extension updated, it's expensive. And the problem is that this is not transparent information, you do not know this when you buy. In "Product details", lower right corner you get this information "Support Plan:3 Months (Free),6 Months,12 Months". What is "Support plan"? Apparently support plan refers to support and updates. Dear Cozac Sorin, thank you for your positive star rating for our AMP Plugin. We would like to answer your concerns about the support & updates period. After hearing your concerns and questions of other clients, we have decided to change our updates policy. On October 4th, 2018 we at Plumrocket started providing FREE LIFETIME UPDATES on all our products. From now on, once you purchase any extension at our store, you will be provided with free updates without limitations. Once again, we are grateful for all client feedbacks. They make us a better company and help us offer best Magento extensions and services. This extension was extremely easy to install and just works out of the box. There was no problem at all with the installation and it was very easy. Also the support from Plumrocket has been perfect. Amp is a very good plugin. 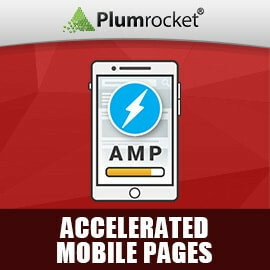 Now our AMP pages load really fast on mobile. Support is very helpful. I recommend it to everyone. Keep up this very good work. I think this extension is very useful. For a Magento didn't have a custom responsive template. AMP is your best choice. AMP from Plumrocket is super easy to install and edit the templates for AMP. You don't need a super skill to configure it. We were looking for something to help speed up our Mobile Magento2 site as we were not happy with how the slow the site loaded on mobile. Wow...this product did the trick! We were experiencing home page load speeds of 2.3 seconds on our mobile site, with AMP it is 696ms! AMP is not currently available for dynamic pages (Cart, Checkout, Forms) but so worth it for Home Page, Category Pages and Product Pages. I've tried other AMP-modules but they didn't work at all with custom themes. This AMP-module is working perfectly with Magento 2.2 and Ultimo theme. It was easy to modify both the design and the CSS. 5/5 - great work! I can say it's worth buying. I upgraded from AMP for Magento 1 and was extremely happy with its performance. Highly recommended for everyone who is looking to be AMP Compliant. It also ensures good site speed by chucking out the unnecessary elements on the website. Most needed due to many more customers now using mobile devices and they just don't want to wait for page loads. Easy install from the team and works all ok with magento 2.2 so thumbs up. With the increasing number of mobile users for browsing net, it is a must have extension and also they have done it very neatly. I was stuck after installation with configurable products but the support team came to my rescue immediately. It's very practical, I didn't expect it to be. Fast as lightning especially that more customers prefer browsing on mobile. Thank you for this beautiful extension. Install is easy and works as you expected to do. A great way to get higher in Google search and increase the conversion. Have great software and great service. Very simple extension but it's really something you need if you care about your page rank. The design is really minimalist but page are load very quick. I love this extension. Super easy to install and to use. My google mobile page speed is now 90/100 instead of 45/100. Make sure you install it from their website using their method, and not using the Magento 2 Component Manager. I had issues with the component manager, but when I did the install directly using the plumrocket files as described on their website, it worked perfectly. Thank you love this! The plugin works like a charm after some modification. Our magento 2 template broke the plugin at some places. This was easily solved after submitting a ticket. This is a must have theme for every Magento 2 website that would like to have awesome mobile pages. My Google speed score for the homepage, cms pages, categorie and product pages is now 90 out of 100. Before I installed the plugin it was only 58 at product and category pages so see the difference! The Pagespeed Score has improved drastically with AMP Implementation. Even Google's new project "Test My Site" has given a 40% Boost to old Mobile Version. An Amazing Extension! The mobile browsing accelerated instantly. The mobile speed is just amazing. Design is also neat, couldn't expect better. Thanks guys! Hope to work with you in the future. Definitely recommend this module! Google has been encouraging websites to deploy AMP. Increase SERP while speeding up your page views. AMP saves broadband and increases the speed of page loads. Thus, more sales! Amazing Extension From A Great Company! This extension is just amazing. It turned my mobile site into a blazing fast rocket. Add to that the best technical support I witnessed, that are willing to go for the extra mile to make sure everything is working how I want it to be. I recommend this Extension for anyone who want a really fast mobile version, and a great tech support. I believe Plumrocket are always working on adding new features. This extension is the one you need to start taking advantage of the newest technology out there. Thank you for your warm words. We are happy to hear that you are satisfied with AMP extension and hope that it will help you to achieve new goals in your ecommerce business. We are doing our best to follow all the latest updates and implement this functionality in our extension. As for your request, support of Google Maps can be added only with the help of AMP iframe. Please do not hesitate to contact us if you need help implementing this feature. Ability to show/hide details in product page will be added in the future versions of the AMP extension. Support for widgets and third-party personalized recommendations will be added once this feature is supported via AMP project. This extension initially conflicted with others but the Plumrocket technical team resolved the issues within a couple of days. This product creates a quick mobile experience for the end-user, and the AMP pages were cached by Google virtually straight away. We did have another issue trying to save category images, but this turned out to be a Magento 2 bug due to duplicate url keys. This was quickly resolved by their technical team as pay as you go support. Would recommend this product and Plumrocket. I have recently bought AMP extension for my store. I have not installed it yet in my live site, but it seems from the tests that it is a useful extension and makes the site work fast. I did not have installation problems, settings are easy. Thanks for a customer support! A great extension I would recommend it! Incredible support and respect for the user. As a frank user, I did a review previously pointing out the positives and negatives and the implementations I understood to be necessary for tool. Well, in a short time there was a significant improvement for him, which made our site return and use successfully, improving many aspects, from conversion to interaction with social networks. I would like to thank you for your commitment to make the tool more and more complete. Also in a few days we will migrate the platform to magento 2 and this tool is among the first line for change, ie it will only be migrated when it actually also implements it in magento2. It is in fact the best tool we found, as well as pioneering. We wanted our site to be AMP ready before the Google's First Mobile Search Engine Index happens and With this extension our site was ready with AMP pages in just 3-4 days. Highly recommended. The Extension works out of the box and has beautiful support for any of the concerns. Easy to configure from backend with minimal code touch (unless required). This product works as described. Suport is very attentive and really fast. I'm waiting for the result - ranks in Google search. For this moment (after 3 weeks) my ratings still the same. Maybe Google needs some more time to index. We like the ext very much! Thank you for your honest feedback, although it's not 5 stars. As for the social share functionality - it is already included into the AMP extension roadmap and will be available soon. We always keep track of new features that emerge in the AMP project on GitHub, and those are added frequently. Robson, we are happy you liked the speed of our AMP Magento extension, as it's the key of AMP technology. We appreciate your review, and hope that diving more into the technology helps you get the best out of AMP. As you can see from other feedbacks, the overwhelming majority of reviews are positive and our clients are happy to use AMP extension. Our friendly support will be at your convenience if you have further questions. Easy to install and configure. The extension works flawlessly and 100% as advertised. The support folks were just as great as the extension. I had one request and they solved my problem perfectly. Thank you so much for this great extension and great customer service. Thank you, thank you Plumrocket for this extension! That's exactly what we were looking for! After a few problems with my custom theme, their amazing support has solved everything and now it works like charm. Purchased this to help with the mobile side of things on the website, google has picked up the AMP pages and showing in webmaster tools, though need to tweak listings on website as certain elements aren't allowed on AMP pages such as <block> elements. Thank you, thank you Plumrocket for this extension! That's exactly what we were looking for! After we installed it, our Google Page Speed results for mobile version of the site improved fantastically. When I first started using this extension it had only one or two reviews and I risked purchasing this one but I do not regret it. AMP extension brings more traffic to the site and works really well. Also the support is great and any problems are fixed promptly. You need to remember this is still new extension and there is a room for improvements. So you might want to buy now and get new features in few weeks! I have recently bought AMP extension for our Magento 2 store. It works great! Super-easy to configure! The key thing for me was to increase our page load speed and it really worked in this case. Another great advantage of this module is that our page now is among top in Google. I think it is the first company that developed extension for amp on Magento 2. Great plugin which is very easy to install and get up and running. Not had any issues with it! The AMP extension is very useful and easy to install. The Plumrocket support here is the best! I needed support several times and each time was fast to solved. Thanks Plumrocket! Highly recommended! With the superb support from the guys at Plumrocket I installed this AMP module, which I recommend to everyone who want's the best experience for their customers. Don't think twice, just order this module at Plumrocket and your website wil score 100/100 in Google PageSpeed! Who doesn't want that? This extension is very good if your customers are using Mobile phone. We installed it on our online shop www.newyorkcoffee.de and Google Webmaster Tools immediately recognized AMP functionality. Thank you to the Plumrocket support team who updated the extension to a newer version. I have used several magento extensions for AMP, but none of them gave the results. Plumrocket AMP is the best. Extension is great. Now our AMP pages load really fast on mobile. Support is very helpful. I take my hat off to Plumrocket for this superb extension, it works A1 straight from the word go, and the support given if required is the best I've received anywhere. Thanks Plumrocket! Really work for my site! Make my site look simple, load fast on mobile. Plumrocket modified our custom code. Thank you! Plumrocket made AMP extension so easy to install. It's working perfectly and already show great results on Google. Highly recommended. Vadim, guided me through the process and was very helpful. It's my second time I buy an Extension from Plumrocket, and the results are great. Highly recommended!!! Amp is a very good plugin. Easy to work with and its a very good improvement for the loading time of my mobile website. Its so much faster now. Accelerated Mobile Pages technology is an open source technology developed by Google to improve the mobile web experience for everyone. You can read more information about AMP technology at Plumrocket Blog Post - "Is Your Magento Site Ready for Google AMP?" How can I preview AMP version of my Magento store? I'm using custom Magento theme on my store. How do I know if AMP Magento Extension will not affect my design? AMP pages use their own lightweight templates optimized to load content instantly. The design of AMP pages will look differently from your existing theme, however this will not affect your current website design. Does the AMP technology work on Shopping Cart and Checkout pages? Google AMP technology was designed for the Static Pages only. Therefore, AMP Magento Extension works only on Homepage, Product List Pages, Product Pages and CMS pages. The pages like Shopping Cart and Checkout are dynamic pages, and they cannot be adapted to work with AMP technology yet. Once Google adds the support of the dynamic content – we will certainly provide our customers with the update of our AMP Magento Extension. For now all the dynamic pages will be served as non-AMP pages. I already had Google Rich Snippets and Open Graph Tags added by another extension. Should I disable these extensions while using AMP from Plumrocket? Any Open Graph tags or Google Rich Snippets added by another extension will not affect the AMP Extension from Plumrocket, you can keep them enabled. Does it feature canonical tags as a standard, so that original URLs are referenced on mobile/tablet devices? Yes, AMP Magento Extension includes canonical url tags by default. My site is already mobile/tablet responsive. If we install AMP, what will happen to the existing mobile/tablet responsive pages? Your existing mobile/tablet responsive pages will remain. The AMP pages utilize their own theme, and this theme works separately from your mobile theme. The AMP theme will be working for the customers that came to your website from the Google AMP search results page. In other cases, if customers come to your website directly - your regular mobile theme will be displayed. However, with Plumrocket AMP Plugin, you can also force all mobile users to view only AMP theme if option "Force AMP on All Mobile/Tablet Devices" is enabled in module configuration. AMP pages are automatically generated. If I need some UI changes in the AMP pages, is it possible for us to do it? Yes, we can provide the list of the HTML files you can modify with your development team. Otherwise, if you want us to make the changes for you - please contact us for the customization quote. Is this module working properly in multi-store Magento environment? Yes, Magento multi-store functionality is fully supported by the Plumrocket AMP Extension. How can I test if AMP Extension is working correctly on my store? How to check if my Magento store is cached in Google AMP CDN? Please refer to our online guide to find out if your Magento store has been cached in Google AMP CDN. "Load All AMP Pages Over CDN" option was deprecated due to Google Index issues.